Clear Lake is a city in Cerro Gordo County, Iowa, United States. The population was 7,777 at the 2010 census. The city is named for the large lake on which it is located. It is the home of a number of marinas, state parks and tourism-related businesses. Clear Lake is also a major stop on Interstate 35 with many restaurants, hotels and truck stops. 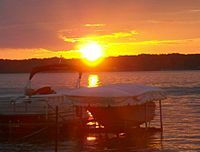 The region around the lake that would later be called Clear Lake was a summer home to the Dakota and Winnebago American Indians. During a land survey of northern Iowa done in 1832 by Nathan Boone, the son of the famous explorer, Daniel Boone, a map was made showing the lake and other bodies of water in the area. 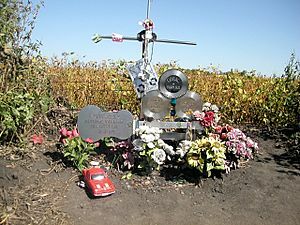 In the early hours of February 3, 1959, a Beechcraft Bonanza aircraft carrying Buddy Holly, Ritchie Valens, and The Big Bopper, who had been performing at the Surf Ballroom in Clear Lake, took off from the local runway in nearby Mason City, on its way to the next show in Moorhead, Minnesota. The plane crashed soon after takeoff, killing all aboard. This event was later eulogized by folk singer Don McLean in his famous song, "American Pie", in which the death of these '50s icons serves as a metaphor for greater changes within American society as a whole. In June 1988, around 600 people gathered to witness the dedication of the monument to the deceased rock and roll legends. Clear Lake also replaced street signs officially changing 2nd Place North to Buddy Holly Place in honor of the late singer. Surf Ballroom- Site of Buddy Holly's last concert, the Surf Ballroom still has concerts and can be reserved as a convention hall or reception site. 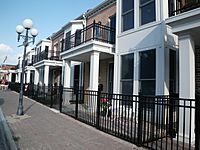 It is also a tourist attraction, and every February has a tribute to Buddy Holly. Lady of the Lake- The stern wheeler ferry boat takes passengers on a scenic cruise around Clear Lake. The Lady of the Lake has an enclosed lower level and an open upper level. Clear Lake Fire Museum- Designed to resemble an early fire station, this museum's highlights include a 1924 Ahrens-Fox pumper truck, the city's 1883 hand-pulled hose cart, and the original fire bell used by the department. Also there is a memorial dedicated to honor all the firefighters who have served Clear Lake. Guardian Angel Roadside Chapel- Built by Jack Kennedy, The Guardian Angel Chapel overlooks Interstate 35 and is open to the public daily. Clear Lake Arts Center- This non-profit organization, the Arts Center displays local and regional artists' work along with a sales gallery and art classes open to the public. PM Park, Clear Lake, Iowa- Site of The Patriarch Militants camp established in 1914, turned into a historical eating and lodging venue. The Mirror Reporter is a newspaper serving the Clear Lake area, published weekly. The Fort Custer Maze, a now closed attraction that operated for 15 years. The Clear Lake Arts Center-Downtown Clear Lake. New building constructed in 1998. Clear Lake, Iowa Facts for Kids. Kiddle Encyclopedia.